Most women spend hundreds and thousands of £££s on cosmetics and beauty products. I for sure can be classed as one of those and I recently had a massive cull of products that I just DON'T use, and will probably NEVER use. I keep them thinking maybe I will use it one day. It doesn't happen. Online beauty retailer Fragrance Direct recently did a poll on how much women spend on beauty products and which of these are neglected, never used and basically dumped in the makeup bag graveyard, or deserted in the darkest depths of the bathroom cupboard. It was really interesting to read, and blusher was the one that most women left unused!! I personally L.O.V.E blusher so all I can say is that maybe you ladies have brought the wrong one or are just being lazy, as the tiniest pop of blush can make such a difference in making a face look healthy and glowing! 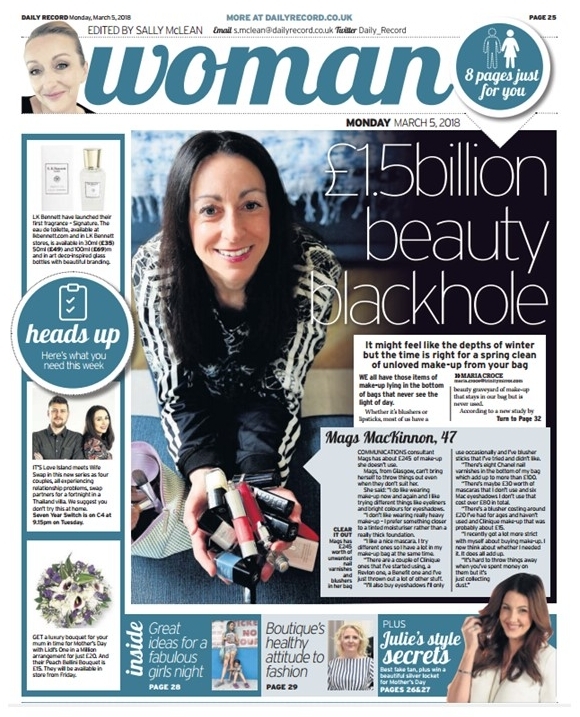 This interesting article was written up in The Daily Record below, with a link to my top 5 products on their website that you can get from Fragrance Direct, which has some great beauty products and cosmetics available at amazing prices, (even cruelty free products). The poll taken by Fragrance Direct was really interesting, showing what products women had in their makeup bags that they never used anymore. If you think that you fall into this category then have a think about having a serious de-clutter of your products and finding your perfect capsule beauty collection and makeup regime. Throw away anything that has not been used in the last couple of months. Don't buy something that you are not going to use, consider your lifestyle, give it away if it doesn't suit you or you won't use it. Shop smarter and only buy what you really need and use. If you need any help then read here or ask away in the comments. Click here to read the 'Beauty Graveyard' Piece on the Fragrance Direct website with my top 5 products that you will not see in the beauty graveyard!